Though I am not straying anywhere near the crowds at Gettysburg, I don’t need to in order to know that there have been tons of people attending sesquicentennial events. That has been clear simply from the activity around Antietam. There have been unusual numbers of people and the park is alive with visitors and activities. On Saturday, I spent some time greeting people in the West Woods and met lots of folks – almost all who were combining trips to the two parks, and maybe a couple of other battlefields. It was like a continuous conversation with people coming and going. Monday, I proved to myself again (for the third time as a guide) that I am a tour guide iron man! Well … iron voice at least! I did three groups and figure that I talked continuously for about 8.5 hours. As I wrote two days ago, I am not a Gettysburg expert at all. But I thought I would write just a bit about Abner Doubleday on this occasion. On this third day of the battle 150 years ago, July 3, 1863, Doubleday was wounded late in the conflict just after Pickett’s charge. In his little book from the Campaigns of the Civil War Series (where he wrote about Chancellorsville and Gettysburg), Doubleday said “… after it (the charge) was over, I sent out stretcher-bearers attached to the ambulance train, and had numbers of wounded Confederates brought in and cared for. I was told that there was one man among these whose conversation seemed to indicate that he was a general officer. I sent to ascertain his rank, but he replied: ‘Tell General Doubleday in a few minutes I shall be where there is no rank.’ He expired soon after, and I never learned his name. 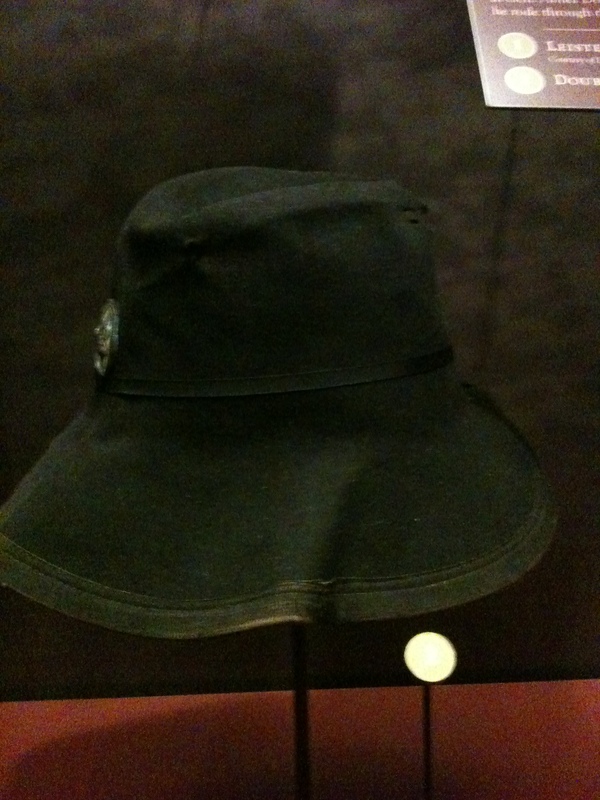 This fragment tore through his hat – which is on display in the visitor’s center at Gettysburg. When doing Doubleday research in the past, there is a letter in the library at the battlefield that was written from the General to his wife, dated the day after the battle – July 4th. Battle Field of Gettysburg, Pa, July 4, 1863. The most awful battle of the war occurred yesterday. The rebels attacked the right and left center and were repulsed. They then attacked near my position (in the center) opening with from 100 to 150 pieces of artillery. Words cannot describe the terrific shower of missiles poured upon us. Two private horses belonging to me were killed and three belonging to the members of the staff. One of these horses was my splendid bay, the other a cheap pack horse given me by the mess. After several miraculous escapes I was hit and knocked over on my horse’s head by a piece of shell which struck me in the back of the neck after cutting through my hat (sketch of the piece of shell) . . .
Luckily I was hit squarely by the smooth, round surface. Had the jagged part struck first it would have killed me. My hat I suppose turned it. My head aches from the blow and my neck is sore swollen and stiff, but I shall be all right in a day or two. My raw Vermont troops with the 20th N.Y.S. Militia and 151st Penn. not only resisted the attack (which was led by Pickett in person) splendidly but captured several battle flags and took several hundred prisoners. Nevertheless we have had an awful slaughter. There is hardly an officer left unhurt in the 1st Army Corps. . . . He goes on to talk of others who were wounded and who had died. He also proclaims that he is now worthy of a corps command – that he should get it or else otherwise resign. Well, he would not get it, as Meade put John Newton (Doubleday’s junior) in charge. He was forever bitter about this and held the grudge the rest of his life. As well, Doubleday never fought again in the War, serving in duties in Washington for the remainder. Posted by Randy Buchman on July 3, 2013 in Abner Doubleday, Antietam / Battlefield Guides, Gettysburg Campaign and tagged Abner Doubleday, Pickett's Charge. It is written here and there. Frankly, both of them could be snarky personalities. Doubleday lived longer and had opportunities to make his case before the CotCotW and in other writings.Glad to see you are out there! Huge crowds at Antietam this week also.